About half of American technology companies have women in top positions. In China, it’s closer to 80 percent. I spent much of the summer of 2015 covering the absolute unraveling of Uber China, a multibillion-dollar effort that failed spectacularly. When Uber ultimately admitted defeat in 2016, Shonda Rhimes couldn’t have scripted the narrative better. This article is adapted from Lacy’s new book. Uber had devastated competitors in each market, and its Chinese competitor Didi Chuxing turned Uber’s game on itself. Didi was the only ride-sharing company in the world whose resources rivaled Uber’s, backed by two of the largest Chinese internet companies and several of the largest hedge funds in the world. And while there was never any evidence of the Chinese government making life any worse for the American company in the market, Didi obviously had the home-field advantage when it came to working politics in China, if it came down to that. And China was already the largest ride-sharing market in the world by rides. In January 2016, Didi announced it had completed 1.4 billion rides in 2015, some 40 percent more than the 1 billion rides it took Uber eight years to rack up. Uber was not the largest ride-sharing company in the world by a large and widening margin, despite its bravado and its valuation. And the face of Didi in the fight was its president and COO, Jean Liu. A woman. A mother. As I dusted off more and more of my China contacts in reporting this story, I was struck by how many of the C-level officers running Chinese companies were women. And how many of them were CEO, COO, CFO, or even CTO. They weren’t merely the token senior woman on the team running HR or marketing. It was far more pronounced than the “Get me a Sheryl!” trend in Silicon Valley, which was still limited to a dozen or so companies. Silicon Valley Bank has a huge practice in China, and they were intrigued by anecdotal evidence of a major gender disconnect between the two tech hubs. They did a study of 900 or so clients across the United States, the United Kingdom, and China, examining how women fared at the senior levels. The results were hard to believe for Americans who hadn’t done business in the tech world in China, and obvious to those who have. I don’t even think that tells the whole story, because anecdotally many of the Chinese companies I’ve spoken with have more than one senior woman and these women are in a larger variety of roles. At the board level, only 34 percent of U.S. companies said they had one or more female directors on their board. Thirty-nine percent of U.K. companies said they had one or more female directors. Sixty-one percent of Chinese companies had one or more female directors. Even crazier, when asked if these companies had programs in place to increase the number of women in leadership positions, 67 percent of those in the United States said no, and 80 percent of those in the United Kingdom said no. Meanwhile, 63 percent of those in China said yes. Women in China have substantially higher representation at the top of corporations, and yet more of these companies have programs geared toward creating greater equality. These three stats taken together show the rebuttal of the “queen bee” myth in action: When enough senior women are empowered in an organization, they overwhelmingly support other women. It’s the good kind of entitlement. The kind white men have in America. In the venture-capital landscape in China, it is even more extreme, as Bloomberg reported in September 2016. According to their numbers, among the top firms in the United States, women make up 10 percent of the investing partners and only half of the firms have any female investing partners at all. In China, 17 percent of partners are female and a stunning 80 percent of firms have at least one woman investing. Because firms with just one female partner are twice as likely to back female entrepreneurs, this has had a huge ripple effect on women’s roles in the ecosystem. The Chinese government says that women have founded 55 percent of new internet companies and more than 25 percent of all entrepreneurs are women. Yes, those stats came from the Chinese government. But clearly the “pipeline” of women to sit on far more tech boards and occupy so many senior jobs at tech companies is coming from somewhere. While the percentages may not be quite that high, women are getting more opportunity at seemingly every stage of the tech ecosystem in China. Bloomberg profiles the very press-shy Chen Xiaohong, who just raised a new $500 million fund, the largest in the world run by a woman. The largest female-run fund in the United States is half that size. In total, Xiaohong controls more than $1 billion in assets under management. Through it all, she raised three children. Her work habits would have been unusual, if not unacceptable, in the West. She brought her firstborn son to the office every day for three years. She says that bringing her children helped build a bond with many of the entrepreneurs she backed. Her son did cry and disrupt meetings, but that didn’t stop her. It gave her a chance to develop a more personal relationship with founders. As I dug into this more, I found several common views of why things are so different for professional mothers in China. One is that the tech industry in China is both fledgling and a massive opportunity all at once. All sorts of people with nontraditional experience get opportunities they wouldn’t have in a more mature ecosystem. But that doesn’t come close to explaining all of it. A lot of it is cultural, too. Some of it goes back to communism, when Mao Zedong said women “held up half the sky” and they were expected to work just as hard to provide for the many. They labored in the fields and historically even fought alongside men in wars. “They needed the entire population to be working,” Zhao says of the 1950s era. The older precapitalist generation of women simply were never given the choice not to work, not to serve the government in some way. And yet, even stranger than “thanking” Chinese communism for women’s current success in the tech industry, the one-child policy comes up in every conversation I’ve had about this topic. That’s not a shock because for 35 years it affected how one in six people on the planet were “born, live, and die,” according to Mei Fong’s excellent book One Child: The Story of China’s Most Radical Experiment. Let me say in as emphatic terms as possible: No matter how many Chinese women become C-level officers, the one-child policy was not a coup for feminism. There are horror stories of forced ninth-month abortions, 20 million forced sterilizations, and some 60 million missing Chinese girls—killed, aborted, or seized and adopted away. Despite all this, even Fong notes, there was exactly one group who did benefit from this policy: urban Chinese women. If you are a female born after 1980 in a major Chinese city, your chances of surviving past childhood, getting enough nutrition, and attaining higher education are significantly better than those of a Chinese daughter born in any earlier period this century or last. As a result record numbers of women in China are receiving a college education. In 2010, women made up half of the master’s-degree students in China. The country’s female labor-force participation is among the highest in Asia, with 70 percent of Chinese women either employed in some capacity or seeking employment, compared to just a quarter of their Indian sisters. What China is creating in its tech sector are new role models and new patterns. And that matters more now to Silicon Valley than it might have a decade ago, because their companies are competing with ours. It was a Chinese company, not Lyft, that humbled and beat Uber. And the public face of that fight was a woman. A mother. That matters for China, but it matters for the United States, too. 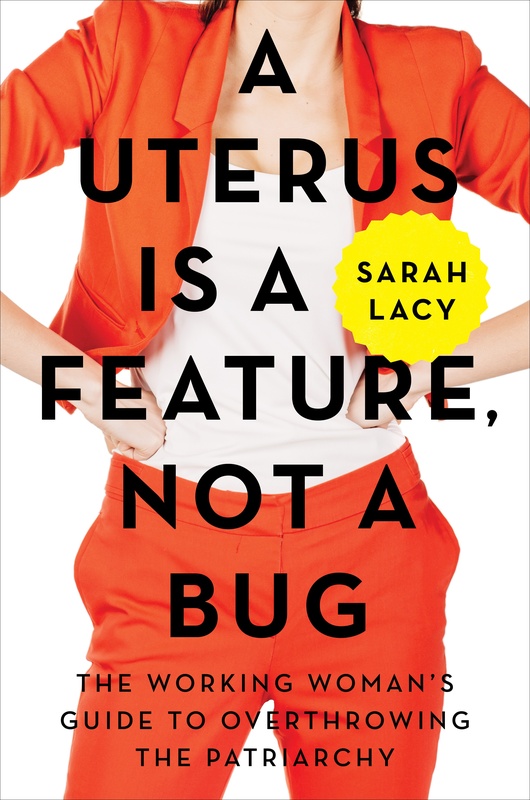 This post is adapted from Lacy’s new book, A Uterus Is a Feature, Not a Bug: The Working Woman's Guide to Overthrowing the Patriarchy. Sarah Lacy is the founder and editor in chief of Pando. She is the author of A Uterus Is a Feature, Not a Bug: The Working Woman's Guide to Overthrowing the Patriarchy.